Pay just $99 when you use our BestOfVegas deal for $25 off a nighttime Vegas helicopter ride of The Strip. Champagne toast and round trip transportation from your hotel are included! Just click on your friend Coupon Puppet below to book this tour from Maverick Helicopters. We’re going to be honest with you. Coupon Puppet is terrified of small things that fly in the air such as prop planes and helicopters. But if we weren’t such big scaredy cats, we would do this Vegas helicopter ride from Maverick Helicopters in a heartbeat. It sounds amazing! First, you are picked up at your hotel. Second, you ride to the helicopter terminal, which is not far away at all. It is on the edge of McCarran International Airport, just a half mile south of the southern most point of The Strip (Mandalay Bay). Third, it’s time for a champagne toast (natch). Fourth, it’s time to get in the aforementioned vessel that terrifies Coupon Puppet, a swankily outfitted helicopter. How swanky? They call it the Limousine In The Sky! Once you are in the air, your Vegas helicopter ride only takes about fifteen minutes. But that is all the time you need to survey The Strip in all its glory, from Luxor’s powerful beam of light in the South to the looming tower of The Stratosphere to the North. You’ll even check out Downtown! Lastly, you’ll gently touch down in this very safe aircraft that Coupon Puppet is silly to be so scared of, and you will be driven back to your hotel with visions of neon and dancing fountains in your head. Maverick Helicopters has been around since 1995, and they run like a well-oiled machine! The evening Vegas helicopter ride runs four times nightly, at 6, 7, 8 and 9PM. All ages are welcome, but those over eighteen must have a photo ID. A note for our huskier friends: anyone over 300 pounds must purchase two seats. 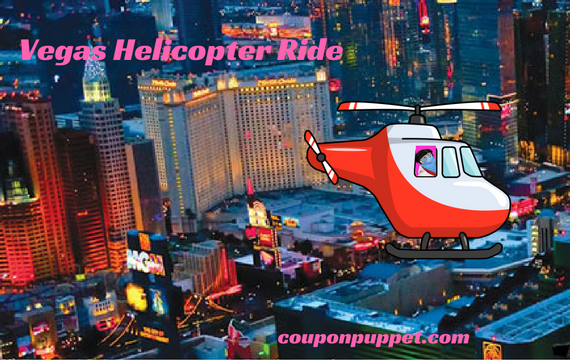 Coupon Puppet Hopes You Have A Great Time On Your Vegas Helicopter Ride!